Mark: Hi. It's Mark Bossert, producer of the Pawlik Automotive video and podcast series. We're here with Mr. Bernie Pawlik, Pawlik Auto Repair in Vancouver, BC. 19 time winners of Best Auto Repair in Vancouver, as voted by their customers, and of course, we're talking cars. How are you doing this morning, Bernie? Mark: So 2004 Toyota Sienna is today's victim. What was going on with this? Wiper motor problem? What was going on with this vehicle? Bernie: Yeah, the rear wiper on this vehicle had quit working. We'd done some diagnosis and found the motor was dead. Actually, this client brought this vehicle to us quite a while ago and so he'd been living with a dead motor for a while. This was the day to repair it. Mark: So what might have caused the motor to die like this? Bernie: Well, if you looked at our podcast we produced last week about some tips on preserving your windshield wiper and motors, which I mean a possible cause of this could have been that there was a lot of snow on the back window when he went to use it, burned the motor out. Could also be that he left the motor on the windshield wiper was iced and frozen onto the back window at some point in the past and caused the motor to burn out. That's a common cause of these kind of issues. Bernie: Other items that happen is of course, it's just things just get old and wear out, and that does happen. The other thing, too, is rear wipers are one of those things where sometimes people will very rarely ever use them and it's kind of like a parking brake, where if you don't use something for a long time it may actually just stick and gum up and not work. We see that with parking brakes, for example. People with automatics, they never use the parking brake and all of a sudden one day, they're on a steep hill and they say, "Hey, I better use the parking brake." It hasn't been used in five years, they put it on and the cable sticks. I mean, the wiper motor's a little different, but it can have the same kind of issue if you don't use it for a long time. One other item we do find with wiper motors, too, is moisture intrusion. A seal can get weak and then water can seep down the shaft and into the motor and jam it up. In the case of this one, and I'll show pictures in a few minutes, it didn't look like there was any evidence of that. Hard to know, but those are some of the causes. Mark: Is this a complicated replacement? Bernie: Not particularly on this vehicle. There's a panel that needs to be removed on the back and then the motor sits right there. Wiper linkage and the wiper arm has to come off, but that's pretty much it. We can actually get into some pictures right now. There's an 04 Sienna. This is not the vehicle we worked on, but I like this picture because it actually shows the back of the vehicle and there's your rear wiper with the motor. The motor will be located right back in here. When you pop the tailgate open, there's a panel and that can be removed and that's where the motor's located. There is the motor. This is the old one, out of the vehicle. I mean, it really doesn't look ... it looks to be in really good shape, but somewhere inside the motor's burned out or something's happened that's causing it not to work. You know, sometimes if it'd been rust and moisture damage, you'll often see some rusty, sort of evidence of rust around the shafts or seeping out of the motor. This is just one side of the motor, but the other side looked fine, too. That's basically it. Pretty simple device. This is a motor. It's got the linkage, well it doesn't really have linkage because it's one piece, but it has all the gear mechanisms and whatever causes it to move back and forth, the gears, they're all in one assembly so pretty straightforward. Mark: And how did you replace it? Bernie: So we used a used part in this case. You know, it's an older vehicle. A new motor was really only available from Toyota and really quite expensive. We were able to obtain a used motor for about half the price of a new one and the owner was good with that. That's what we did and it worked great. Mark: Are used parts always a good option? Bernie: No, they're not. You know, we do it on a case by case basis. Based on experience, certain items ... say a wiper motor like this. We can test it, we can listen to it, make sure it's not growling and making weird noises before we install it. Then it's a pretty good guarantee at least that the motor itself is in good shape when we install it. There are certain items that are not worth risking used. Over the years, I've seen cars where they have, certain engines will have very common failures and it doesn't make sense to spend the money and the amount of work involved putting a used engine in whereas a remanufacture engine would just make so much more sense, although a lot more money. The possibility of failure is quite high. So that's kind of what we look at. There are other used parts where, I mean, it's just basically a solid piece of metal and you can be pretty assured it's going to work. Used parts, again, it's on a sort of as ... you got to kind of do a cost benefit analysis of doing a used part. Mark: And of course, after replacement, works everything works fine and this fifteen year old Toyota Sienna has a lot of life left in it, is that right? Bernie: Oh yeah. Yeah. It's a good vehicle. Definitely very reliable vehicle. I will say, in terms of cost for repairs, a lot of these vehicles, they can be a little costly. As I was saying, the new wiper motor was a pretty expensive piece. We'd done some repairs on one of the sliding doors in the vehicle, this has power sliding doors, and there was some pretty expensive latch ... I can't remember exactly what we did on it it, but the final bill was quite expensive and so I'm going okay, it's ... sometimes we think Japanese vehicles are so much cheaper than a German vehicle, but often they're not. They just tend to last longer before things tend to go wrong. You can be faced with some expensive repairs on Japanese vehicles. Just often, things are built as assemblies and you can't buy just a little piece for it. Mark: And wiper motors can be pretty expensive as well. I think we mentioned that last week. Bernie: They can, absolutely. And it really depends from car to car. In some more common cars, I think of American cars as being more common, which is not necessarily true, but in more common, there's a lot remanufacture options available. Things like rear wipers, for instance, they're not a very common replacement item, so they, a lot of times there's not a lot of aftermarket replacement pieces for them. Front ones, there's a lot more options. Mark: So there you go. If you're needing some service on your Toyota Sienna, or any Toyota product in Vancouver, the guys to see are Pawlik Automotive. You can reach them at 604-327-7112 to book your appointment. You have to call and book ahead. They are busy always. Or you can check out their website pawlikautomotive.com. YouTube channel, Pawlik Auto Repair. Literally almost a thousand videos on there now of different makes and models of cars from the last 8 years of our doing these kind of broadcasts, as well we don't give over the phone estimates and we don't really like giving advice because we don't know your particular situation. So please enjoy our podcast and videos. Thank you for watching, and thank you, Bernie. Bernie: Thanks, Mark, and thanks for watching. We totally appreciate it. Mark: Good morning! It's Mark Bossert, producer of the Pawlik Automotive Podcast. We're here with Mr. Bernie Pawlik, of Pawlik Automotive in Vancouver, Vancouver's best auto service experience. 19-time winners of Best Auto Repair in Vancouver, as voted by their customers, and we're talking cars. Mark: How are you doing, Bernie? Mark: Today's victim is a 2009 Toyota Highlander with a brake backing plate issue. What was happening with this Toyota? Bernie: This vehicle, our clients were concerned. There was a squeaking noise, kind of intermittent but coming from the rear of the vehicle somewhere. That was their primary concern. It's kind of a rotational squeaking noise. When we looked at it, we found it looked like the noise was coming from the back brake area. Mark: And what else did you find? Bernie: Well, we did a brake inspection. What we found when we took everything apart, was a lot of rust on the brake backing plate, in fact, the right rear backing plate was so badly rusted, it was starting to disintegrate. And when that happens, the rotors, parking brake shoes, things start to rub in ways that they're not meant to rub, so that was causing the squeaking sounds. Mark: Okay. Why would that happen? Bernie: Basically, the backing plates, it's rust. There's vehicles from back East, eastern US, where they use a lot of road salt. I'll just get in some pictures right here, so we can have a better idea of what's going on, but it's road salt. Here's our Highlander. I mean, as far as road salt, you'd never guess, the outside of the vehicle looks in good shape, and I have to say, auto manufacturers have really done a great job over the last couple of decades making their cars out of good quality metal, because back in the ... especially the seventies, and eighties, a lot of cars, especially some Japanese cars, were really bad. They just rust out, and cheaper quality cars, rust was a big problem. But nowadays, we do find problems underneath the vehicle, where vehicles have been driven in those kind of corroded conditions. Here's the left rear back plate. This is actually the one that was in better shape, a little more solid than the one on the right, but you can see, a lot of rust here, a lot of rust; the paint's basically gone. And down here is sort of the worst area on this side, but on the other side, it was literally ... It rusted so bad, it was breaking apart. You can see here, the parking brake shoes have never been changed. There's still some material on this shoe, but the angle I took the photograph on, the rear shoe had very little friction material left. This is kind of the ugly part of it, and getting back to ... That's a replacement. This is on the right-hand side, the side that was worse worn. You can see the plate is solid, the shoes are thick, and there's a final picture. That's the brakes back together, new rotor, new ... Sorry, not new ... New pads, new rotor. The calipers were actually still in good shape, so we're able to clean and lubricate them, and make all that work. Mark: Were there other brake components that were worn out as a result of the rust? Bernie: Well, not necessarily as a result of the rust, but at this point, other things needed to be replaced. The pads and rotors were worn. You know, rotors tend to take the brunt, especially in salty climates, rotors tend to get damaged really quickly. The surfaces rust, because it's bare metal, and they heat and cool, heat and cool, and with salt, they just start to rust pretty badly. Driving around this kind of climate where we use very little road salt, they can tend to last a long time. But in saltier climates, they go pretty fast. Mark: Well, let's be specific. In snow, in climates where they get a lot more snow, where they use more road salt. Bernie: Exactly, yeah, that's a good distinction. Yeah. No, I'd say road salt climates are the worst. But actually, interestingly enough, if you live near a coast, where there's a lot of wind and sea spray, that can actually have a pretty bad effect on your vehicle, too. We do see some vehicles that have damage from that. You have to be a little cautious if you live somewhere by a windy coastline. Almost have to treat your vehicle almost like you would driving it in road salt kind of conditions. Mark: What can you do to alleviate or kind of take some preventative actions in an area where there's a lot of road salt or it's just basically a salty climate? Bernie: Well, best thing to do is flush the undercarriage of your vehicle as frequently as possible, and that's always easier said than done, especially if you live somewhere where the temperatures remain sub-zero for maybe a month or two on end, and you're basically just left with having the salty grime under the vehicle. It may not be possible, but where it is possible, flush underneath the vehicle as much as you can, because that will prevent this kind of thing happening. And that's really getting a hose into a back brakes, it's getting it underneath the vehicle, spraying all over the place, because this is where the salt sits and starts corroding things like brake lines and fuel lines and brake backing plates, thin sheet metal kind of pieces. That's the best preventative thing you can do, if possible. I also had a client once from Montreal, where they use a lot of road salt, and she told me ... had an older Volvo. I said, "It's surprising how little rust there was in this car." It was a 10-year old Volvo. And she said, "The secret, what I've done is, I never let ... when it's road salt season and cold out, I never put the vehicle in a heated garage. It always stays outside so it stays cold all the time." I thought, that's a pretty smart idea. Something you might wanna take on if you live in such a climate. You don't get the privilege of getting into a warm car in the morning, but at least your car will last longer, which is probably a good thing. Mark: And the joys of scraping your windshields. Mark: The chemical reaction takes place. Bernie: Chemical reaction's having a good time. Mark: How are Toyota Highlanders for reliability? Bernie: Well, they're awesome. Yeah. Really good, nice little SUV. Smaller size. You know, very reliable. Not much bad I can say about them. They really ... Do the maintenance, they'll last a long, long time. Mark: There you go. If you're looking for any kind of brake backing plate issues or squeaking or service on your Toyota Highlander in Vancouver, the guys to see are Pawlik Automotive. You can reach them at (604) 327-7112 to book your appointment. You have to call and book ahead. They're busy. Or check out the website, pawlikautomotive.com. We've got hundreds of articles and videos on there over the last eight years, as well. Our YouTube channel, Pawlik Auto Repair. Again, hundreds, literally. Getting close to a thousand, actually, on there, and all makes and models and types of problems and repairs, and of course, thank you for watching the podcast. And thank you, Bernie! Bernie: Thanks, Mark. And thank you for watching! Mark: Hi, it's Mark Bossert, producer of the Pawlik Automotive Podcast. We're here with Mr. Bernie Pawlik, Pawlik Automotive in Vancouver, Vancouver's best auto service experience. 19-time winners of Best Auto Repair in Vancouver as voted by their customers. And we're talking about cars. How you doing this morning, Bernie? Bernie: Doing very well this morning. Mark: So we have a 2009 Toyota Venza that has interior mold. This is pretty unknown territory for us to cover. What was going on with this Toyota Venza? Bernie: Well, yeah, this vehicle was brought to us by a client who, they'd moved from Alberta, they'd left the vehicle sitting for a few months, and wanted to now insure it in British Columbia, so if you're unfamiliar with the laws around these parts, when you bring a vehicle into British Columbia, it has to have a provincial safety inspection on the vehicle. So we got into the vehicle, or opened the door, and found this severe mold, like really dangerous level of mold inside the vehicle. And so what prompted me to want to do this podcast is, I want to educate folks who are moving, perhaps from other places, of the dangers of mold and how it can happen in vehicles. Or if you're planning on storing your car, that this is a real issue that can happen. So we'll get right into pictures, because that really shows the best ... So there's our Toyota Venza on the outside. It's a little dirty. Again, it had been sitting for a while. But nice, clean, straight body on this vehicle. But getting into pictures that sort of ... we say a picture is worth 1,000 words, that's the picture. This is the passenger seat. I'm not an expert on mold, but there's definitely a few different strains and types of mold. And really not removable by shampooing, especially this black mold. Once it gets in, it's in there and stained, and it'll never come out of the interior. Another view, this is the back seat of the vehicle. As you can see, it's covered as well. The driver's, we'd been sitting in it with blankets on top to protect ourselves. But other areas, too. This is just, when you open the driver's door, you've got mold and dirt here, there's mold growing down in these areas, and just all over the vehicle, and in any sort of space where there's some organic material, basically mold growing. Mark: So is there anything that can be done about mold when it's this severe? Bernie: You know, what the owner of this vehicle's faced with doing, because ... well, first thing we thought is, okay, we don't even want to get in this vehicle and drive it. Let's get it to a detailer to have it cleaned out and taken care of. So we took it to a nearby detailer, very reputable, they do a good job, and their first look was "Oh, you know, we can't clean this out. That'll never come out of the vehicle." If it was light mold, maybe a lighter colour, they might have been able to shampoo it off. But they kindly treated it with an ozone machine, which kills a lot of mold spores, and certainly reduces the odour greatly, to the point where we could actually at least get in the vehicle and use it. But we always had a mask on. But the long and short of it is what the owner of the vehicle's now gonna be doing, is actually having the interior ripped out of the vehicle. Some things can be shampooed and cleaned, but the seats will more than likely need to be replaced, the upholstery and the seats. Mark: So as you alluded to, it's not really even safe, when the mold is this bad, it's not really even safe to be in the vehicle, is that right? Bernie: No, definitely not. You could get very sick from mold. I mean, I've been in a lot of cars that are moldy. We've probably all been in, walked through a house that's got a little bit of mold in it. But long-term exposure to these kind of things could cause some pretty severe sicknesses. So it's definitely not the kind of thing you want to be in. Mark: And so how did mold this severe form in the vehicle? What's sort of the history behind it? Bernie: So this vehicle was brought from Alberta, which is a much drier climate. The owners had left it sitting for a little while, a few months, she told me. And when they got back in the vehicle, it was full of mold. And she said "I was really surprised, because in Alberta you can leave things indefinitely, and you never get mold. It's a much drier climate." But here on the coast, it's wet, and mold is just the kind of thing that happens. I've been in people's cabins that have been left to get too cool and moldy. But a lot of things that cause mold, of course, are moisture and organic material. So you spill some coffee on the carpet of your car. There's something for mold to ... I'm not a scientist on this stuff, but mold will form around these kind of things. And you know, it's really where there's moisture, there's maybe a little bit of warmth, but not a lot of air circulation and usage, the mold will develop. Mark: Yeah, this almost looks like the kind of level of mold that you would see from a car that had been in a flood or in a hurricane or something like that. Bernie: Well, exactly. Now, yeah, and of course the key with that is there's too much water content in the vehicle. So for whatever reason, you know, there's a lot of moisture in this vehicle, and that's where it came from. This certainly wasn't a flood vehicle, but that's the kind of thing you can expect from a flood-damaged vehicle also. Mark: So how can you prevent this from happening to your vehicle? Bernie: Well, that's an excellent question. And of course, as I said, the reason I wanted to do this podcast is for someone who's moving from a drier climate to a moist climate, just be aware that mold is a big issue if you leave a vehicle sitting. Where you store the vehicle is, of course, important if we're talking about cars. If you have a heated garage or maybe an underground, in an apartment complex storage where it's very dry, that's a good place to store it, because mold isn't gonna likely form. But for other areas, I mean, I have an RV trailer. I always put these, they're called Dri-Z crystals, I'll show you a picture in a minute, in the trailer. And this prevents mold from forming, because I can guarantee you it's in the first year of owning a trailer, it would have been full of mold. It's just the way we use these things, there's moisture, mold forms really quickly. So we'll get back, do another quick screen share here. Yeah, so this is a really good mold preventative technique. So if you have a vehicle, say you're not gonna drive it for a month or two and it's gonna be stored outside or wherever, there's moisture, you can get one of these, it's like a special basket, and it holds these crystals. And underneath it traps water. So putting one or two of these inside a vehicle would be a fantastic thing. Even one is probably enough. And that basically just takes all the moisture out of the air. Somehow they bond with these crystals and it drops in this bucket here. So that's a really good way to prevent mold. There are probably some other chemical methods that I'm not aware of. I've used this in my RV trailer and it works fantastic. And I'll just show another shot, you can see more detail. This is with the top of the basket, these are these crystals. And I don't know how they do it, but it just absorbs moisture right out of the air. One caution, though. If you do do this, be very careful with this water. If you spill it on anything, it's highly toxic. And it'll stain fabric, so just be careful with it. Mark: So the interior obviously needs a lot of repair on this, and expensive repairs, I would assume, on this Venza. But how was the rest of the car? Bernie: Oh, it was good. It needed a couple items, had a cracked windshield, typical for Alberta. Every car comes from Alberta with a cracked windshield. That, and a tail light, and a check engine light. You know, a few minor repairs. Other than that, the vehicle's in really good shape. Only 110,000 kilometres. So it's a Toyota, lots of good life left in it. Bernie: Yeah, you're a fan of Venzas, I know. Mark: And of course, we don't have rocks in British Columbia, just wet. Bernie: Oh, yeah, we do. It's kind of a joke, but it's like some places the roads are a little more gravelly, cracked windshields are just the norm. Mark: So there you go. If you have run into mold in your vehicle, take precautions, don't leave them out for very long, or come and see us at Pawlik Automotive. You can reach us at 604-327-7112 to book your appointment. Have to book ahead, we're busy. Or check out the website, PawlikAutomotive.com. YouTube channel, Pawlik Auto Repair. There's hundreds of videos on there on all makes and models and different issues with vehicles, and years of vehicles. And of course, thank you so much for listening to the podcast. Thank you, Bernie. Bernie: Thank you, Mark, and thanks for watching. Mark: Hi it's Mark Bossert, producer of Pawlik Automotive Podcast here with Bernie Pawlik, Pawlik Automotive, and we're talking cars. How are you doing this morning Bernie? Mark: So this week's victim is a 2003 Toyota Matrix that had an EVAP system problem. What's an EVAP system and what was going on with this vehicle? Bernie: Alright, well first of all the vehicle came in with a check engine light and it had been at our shop previously several months ago with the same check engine light and the same trouble code. I'll talk about that in a minute but the EVAP system basically is a, it stands for evaporative fuel system and what it does is it prevents gasoline vapours from escaping to the atmosphere. Gasoline, if you've ever filled your gas tank up on a hot day you'll see all that vapour kind of floating away, unless you're in the US with one of those gas pumps that keeps the vapour contained. Basically what happens is that gasoline is very volatile and it evaporates very easily and that evaporated fuel is all hydrocarbons that creates smog and a lot of pollution. It's a huge issue, you think oh it's just drifting away but it actually creates a lot of issues so, not to mention it's actually your money that's actually floating away in to the atmosphere so it's a good idea to keep the gas contained and that's what the EVAP system does. It's rather complicated, I mean it involves a gas tank, a sealed fuel filler, and a number of pipes and valves and sometimes motors to keep the system contained but it allows the air to be, as the gas is being sucked out of the tank of course it allows air to be displaced but it doesn't allow air to go back, it doesn't allow the fumes to escape back to the environment. So that's basically what the EVAP system does. It's pretty complex but you know it does its job. Mark: So again what was going on with this Toyota Matrix? Bernie: So no performance issue and that's pretty common with EVAP system codes. The performance of the vehicle is often not affected, under certain circumstances it will be but most of the time it doesn't really affect the performance it's just that the system has picked up a fault that could cause gases to evaporate out into the air. So I'll just get into some pictures right away here. Here we've got...what do we have here? Start, there's our 2003 Toyota Matrix, a little old but it's still in really good shape. Look at the trouble codes. So here's a scan on one of our scan tools that show the trouble codes. P0440, there's a malfunction in the system and then a P0446. The evaporative emission control system vent control malfunction. So this is a little more specific of a code and you can see there's a current and history. This is a way trouble codes are often stored. They'll, depending on the scan tool, show what's actually there at the moment and what's history so sometimes you'll only have a history code and not a current code. Anyway that's a question for another time. But what we found with this vehicle, because we'd actually done a previous diagnosis, and actually I guess, I know we had another question of how difficult are EVAP systems to diagnosis and I'll just jump right into that. These can be really complicated and fiddly to diagnosis and what some of the reasons why is that there are certain valves, there's a purge valve and a vent valve, and they'll often malfunction intermittently so we can run through all the tests and we can test it all and it all works fine, clear the codes send it away and then a week later the check engine light is back on because the system malfunctioned. So sometimes, you know we often rely on our data bases of what are common faults in these vehicles. One of the common issues that we ran, so last time we did the diagnosis we did the full system test. We tested for leaks, we found none. We tested all the valves and controls. Everything was working fine. The gas cap was very old and a bad gas cap will cause some of these codes. We replaced the gas cap and released the vehicle with the codes cleared and a few months later the light comes back on again. So without spending a lot of extra money of the clients to test everything that we have already tested, we figured the best thing to do is to just go to the next most common fault and that's the vacuum, the VSV valve on the canister purge tank. That's an extremely common fault on this vehicle and it had never been changed, it was original to the vehicle. It's 180 thousand kilometres, 15 years old, so it made sense to change it at this point in time. Mark: So you have a picture of that? Bernie: Yeah I do. Yeah so that is the VSV, you can see it's a- that's the mounting bracket, extremely rusty. And where this unit mounts, right up here, this is the charcoal canister so this is a big component of the EVAP system. They've used charcoal canisters actually for a long time before they went to all this electronic, sort of monitoring of the EVAP system. This has been around since the late 60s, just to trap gasoline vapours but it wasn't quite as sophisticated as is now. But there's the location, that's the new valve installed. There are various, as you can see the number of hoses that run to a number of different locations and different parts of the vehicle. Hoses that run to engine, hoses that run from the gas tank, hoses that go to the fuel filler neck, they're all over the place. Anyone of these hoses can leak so when we do testing on the system we all test, you know to find out whether there's leaks anywhere in any of these components. And that ends our picture show. Mark: So what happened next? Bernie: What happened next? We replaced the valve, cleared the codes, and so far it's working fine. Now again as mention, this was one of these repairs where we'd already done all our testing and we couldn't find a problem, so we've replaced a couple components, so we'll see how things go. It's not the way we normally like to do things in our shop. We really like to test and find things that are wrong but often, as I said with these valves like that VSV valve, they can malfunction intermittently. They'll be, you know you test it and you power it up manually and it works fine, works fine, works fine and then, you know, a hour later something will happen and it won't work. So a lot of times if it's a known common fault on a vehicle it's a good idea to replace that just to put it aside. Leaks are a good thing, you know leaks are a pretty solid thing to test. We can see them, we can verify that pressure's dropping and in this case it wasn't so, an electronic valve like that is a good call. Mark: So for troubleshooting it's really important that you gather as much information as possible before you jump to what might seem like the obvious conclusion but often isn't. Is that fair? Mark: And how are these Toyota Matrix for reliability? Bernie: They're good. Yeah I mean they're awesome car. Very little goes wrong, even these EVAP systems are very reliable. You know if you're living, by the way EVAP system faults happen a lot more if you live in a climate with a lot of salty road because it tends to corrode things and wear things our a lot faster. But yeah really reliable vehicle. Mark: So there you go, if you want experts in diagnosis and troubleshooting to look after your vehicle the guys to call are Pawlik Automotive. You can reach them at 604-327-7112 if you're in the Vancouver area. You have to call ahead to book because they're busy. Check our their website, pawlikautomotive.com; YouTube channel, Pawlik Auto Repair. Thank you very much for listening on iTunes, we appreciate it. Thanks Bernie. Bernie: Yeah thanks for watching and thank you Mark. Mark: Hi, it's Mark Bossert here, producer of the Pawlik Automotive Podcast. We're here this morning with Mr Bernard Auto Pawlik, the big bopper himself, here in Vancouver, and we're talking cars. How you doing, Bernie? Mark: So we're talking about a Toyota Solara. It's a kind of a unique vehicle, a 2006 that had a timing belt problem. What was going on with this vehicle? Bernie: So yeah, so this vehicle came in for a B maintenance service, which is for us it's an oil, basically an oil change service with a full vehicle inspection. Out of doing the maintenance inspection we determined the timing belt needed to be replaced. Mark: So if we're talking about timing belt replacement I assume you got a lot of other stuff that you have to change? Bernie: There are other items to replace at the same time as the timing belt. Generally when we do a timing belt, we'll do the water pump, the front engine oil seals, the timing belt tensioner. Any pulleys that are ... Anything really affected by the timing belt, or anything that can directly affect the timing belts life span, we do all at the same time. Mark: Did you find that it was worn out, or was it just a scheduled change? Bernie: Well we basically replaced it on the mileage of the vehicle and the fact that we couldn't see any evidence that the belt had been replaced. Now you might want to ask can you not look at the belt? The answer is not without a lot of difficulty. I learned a long time ago when I had a customer with a Subaru many, many years ago. Where it was getting near the mileage of the timing belt, I looked at the timing belt, popped the cover open, it wasn't hard too hard on that car. Looked at it, go yeah it looks fine. Month later the car got towed in with a broken timing belt. So I've kind of learned, now you just never judge them. Now that being an older Subaru those belts are, they break a lot easier, these ones are a lot more robust. But you really can't tell the condition of the timing belt unless you actually take it off. There are a few tell tale signs, we'll look at some pictures in a few minutes of the age of a belt once you take it apart. Things have changed a lot with timing belts, they used to be if you got 100,000 kilometres on a timing belt you're really lucky. That Subaru I was mentioning, those things would often break at 50,000 kilometres, they were kind of a bit of a some bad engineering there. But 50 to 100,000 kilometres was kind of a normal interval for timing belt, now they're up in the 150 to 200 range, and often will go a lot longer than that. Just due to redesign of the belt and how they're built. So we can get into some pictures here. So there's our Solara, these come in convertible and none convertible but this is the convertible model. Real nice vehicle, very similar to a Camry in design and operation, same engine and same drive train. Here's the timing belt and a couple of the components we replaced. So there's the water pump, there's the timing belt tensioner pulley, and of course the belt itself, which is rather fairly long belt, a V6 engine. For our final photo this is a close up of the belt, so I mean the actual teeth on the belt are on the backside, but you can see on this side there's all the lettering. When these belts are new they all have like writing on them, either from Toyota or whatever, after market manufacturers, the brand name, the belt number, some other information. The fact that there was actually none visible on this just tells us the belt’s old. I mean the rubber was fairly old, but was it about to break? Not really, but you just don't want to take a chance with that kind of thing. So that's our picture show. Mark: Okay. I've lost my screen here. So what's our next question? Bernie: Our next question, excellent. So we talked about visual inspections, what do we have? Well timing belt interval, generally in the 150 to 200,000 kilometre range. Closer to 150 is really where you want to do them. Depending on the age of the vehicle as well, that has a bit of a factor in it. This vehicle is 06, that makes it about a 12 year old vehicle, seeing no evidence that the belt had been replaced it's a good time to do it. A 12 year belt is getting pretty old. Also, I guess the question too of all the other items we do, with the water pump, the tensioner, the seals, I mean is that necessary to do it? People are often conscious of the cost, to do everything complete is a fair amount of money. 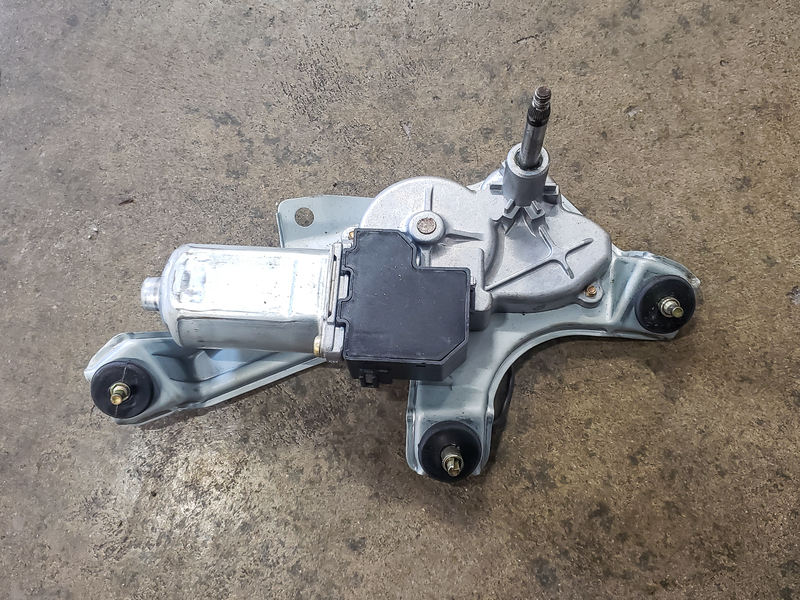 You can just change the belt, however if the water pump fails and it very well likely will pretty soon, or any of the tensioner pulleys, or the tensioner itself, which is a hydraulic unit gives way. The whole job is basically a waste, you have to take it all apart again and do it. So what we do is do the whole job complete, get it all done and then you don't have to worry about it for another 10 years, which I think is the best way to do it. Better to spend the money now and do it fully than ... I've seen so many times when people have taken it somewhere else, and gone I had the belt replaced but I didn't want to do the water pump. A year later they're in for the water pump, and hey I should have done it right the first time. So that's the best thing to do. Mark: Yeah, so is that a case of everything in that kind of, if we're talking about the front end of the engine, or whatever, and all those pieces that are run off of or have something to do with the timing belt, they all wear at the same place, at the same rate in effect. So the belt is worn a little bit and stretched out tight a little bit, puts maybe a little varying amount of pressure on the water pump, or whatever the reality is of it. That they all, they've gotten used to the state of wear that they're all in. When you put the new piece in it actually puts more pressure and wears out the water pump, or the tensioner faster? Mark: What would normally happen. Bernie: Yeah, what would normally happen exactly. Mark: Timing belt replacement around 150,000 kilometres, is that true across all makes and models of cars? Bernie: Pretty much, and I say 150, that might be a little sooner than some recommended. A lot of them are like around 168, which I think is 110,000 miles. But yeah usually somewhere around the 150 to 200 range is where most of them are recommended. I mean the 200 is pretty high, I think there's a couple of Ford products I've seen that have it recommended at that mileage. But yeah, if you're thinking the 150 to 180 range that's definitely time you're going to need to do the timing belt. But check the manufacturers schedule, that's one thing that's really important to look at and follow that one. Mark: So when a timing belt replacement, this is a pretty major job from all the parts that are being replaced. Bernie: It is, yeah, I'd say it's a major maintenance service and certainly you know when you look at two engines on a car, you think okay I'm going to need a timing belt replacement on this one. Say another engine has a timing chain that doesn't need it, I mean there's a ... If you do it properly, I mean a sort of average timing belt job can be $1500 to do it with the water pump, the tensioners, the pulleys, all those kinds of things. Or it can be a bit less, it can be a bit more depending on the car. That's a fair amount of money to put out on a maintenance service, you think well great I'd rather have a timing chain engine. But timing chains do fail, and when they do the cost is a lot higher. So I mean with a timing chain you never know, it may last forever, and it may fail and you just never really know. But the key to timing chain engines is you've got to make sure you follow your oil change intervals. Because you've got that many more moving parts that are affected by, that good clean oil makes a big difference. Mark: So what happens if the timing belt breaks? Bernie: Good question, so if the timing belt breaks your engine will stop right then and there and it won't start again. That's if you have a none interference fit, well that's with any engine. But the other thing is if you have an interference fit engine, which is an engine that's built in such a way that the piston and valves can collide if the timing belt breaks. Then you'll have catastrophic engine damage, the valves get bent, and it becomes extremely expensive to repair. This particular Toyota engine by the way, I was looking for some information is it inference fit or not, I got conflicting information. There's a number of different, if you look on the internet, there's a number of different sites that have lists of engines that tell you, are these inference or not. One website I looked at says yes, the other one says no. Then another one said conflicting information, treat it as an interference engine. So really the best thing to do is treat any car as an inference engine because I mean it's inconvenient when it breaks anyways. But if it does break and causes valve damage it's just horrendously expensive. Mark: Is this a V6 that Toyota used across a different range of models of vehicles? Bernie: Oh yeah they've used it in, you'll find it in Lexus vehicles, you'll find it in Camry's, Avalon's, Lexus, a variety of Lexus products. Pretty common engine, excellent engine, very reliable. Mark: How are Toyota Solara's for reliability? Bernie: It's a Toyota, they're awesome. Yeah, really nothing I can say that's bad about them, they're really good. I mean really the timing belt is one of the, sort of one of the major maintenance items you're going to deal with on this engine, that's pretty much it. Mark: So there you go if you're looking for a service for your Toyota product, since we've pumped Toyota's tires so hard here usually. We like their products, they're reliable vehicles. The guys to see in Vancouver are Pawlik Automotive. We appreciate you folks watching from all over the world, but please if you're calling for service and you're in Vancouver we'd love to hear from you. If you're calling for us to diagnose your car issues over the phone we can't do it. Just can't. So give us a call if you want to book an appointment at 604-327-7112, you have to call to book ahead 'cause we're busy. Or check out our website pawlikautomotive.com, we're on YouTube, Pawlik Auto Repair, hundreds of videos on there. As well as of course we're really appreciating you watching our podcast. Thanks a lot Bernie. Bernie: Thanks Mark, and thanks for watching. Mark: Hi it’s Mark, producer of the Pawlik Automotive Show and Podcast. How’re you doing Bernie? Bernie: Doing very well Mark. 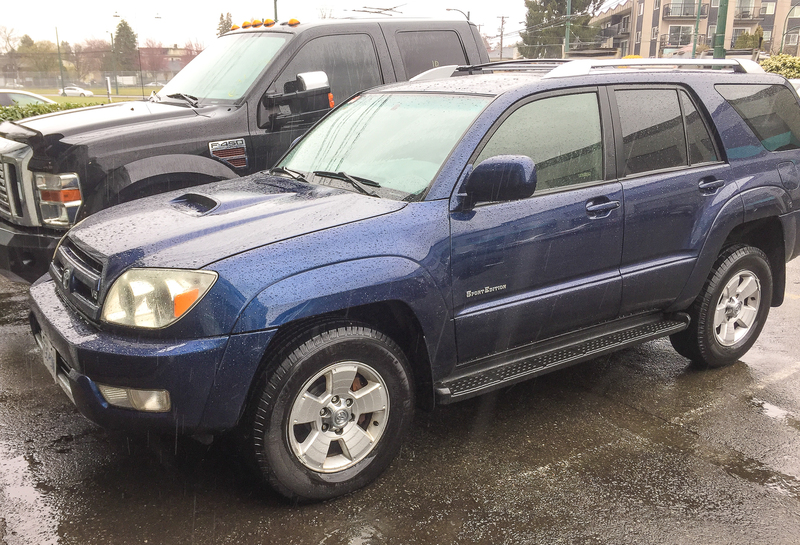 Mark: So we’re talking about cars with Bernie Pawlik, Pawlik Automotive in Vancouver, 38 years of servicing and maintaining cars, trucks, vehicles in Vancouver and 18 time winners of Best Auto Repair in Vancouver and today we’re going to talk about a 2005 Toyota 4Runner. What was going on with this vehicle Bernie? Bernie: So the vehicle came to our shop, a regular client of ours, and the steering was stiff, especially in one certain direction when you turned the steering wheel there was a stiff, tight spot to the steering. Mark: Ok, so what did you find that was going on? Bernie: What we found, we did an inspection on the steering and suspension system and what we found was the universal joint, the U-joint at the end of the steering column, down to the steering rack and pinion was worn out, basically it was just seized in one direction and that was causing the issue. Basically what happened the U-joint allows a twisting motion to occur and when it seized in one direction, it just becomes very stiff to turn the wheel in that one area. Mark: So why do you need a U-joint in the steering column? Bernie: Well I’ll just talk a little history on the steering column. In the olden days, when cars were well, even up into probably right into 1950’s and 60’s, the steering column is just pretty much a straight, long shaft and it would run from the steering wheel down to the steering box. And actually here’s a scary thought, I mean, steering columns used to actually be just a big, huge steel rod and you can imagine what happens when you get in a head on collision and that front of the vehicle gets pushed back a foot or two, basically that steering column just got shoved right into your chest and a lot of people died from that. So one of the first things, one of those sort of safety things, well I say first things, I mean they didn’t really do it probably til the 50’s or 60’s, 60’s for sure, it was mandatory to have a collapsible steering column. So the shaft could actually compress, the steering column would actually be like an accordion type thing where it would actually fold on impact. So that’s a good feature for staying alive in a collision. But anyways, the universal joint, it sort of came after that when steering columns, the vehicles started getting shorter, not such long hoods, they would perhaps go, hey let’s put the steering box, the steering rack and pinion further back in the vehicle and so there’s the universal joint allowed the shaft to go straight and then downward and that allowed the flexibility in the steering column. Mark: Ok, so back to the worn U-joint in this truck, what was causing the, what would cause that to happen, what would cause it to just wear on one side? Bernie: Well what happens, this one here wore from rust corrosion. These, we’ve replaced them on some vehicles and sometimes they just wear out just because, you know they just get moved and turned a lot. But this one here suffered kind of a hard life. The vehicle spent a lot of time out, I would assume on salty roads and basically it was corroded. So at this point we can go into a couple pictures. Toyota 4runner, really nice shape at least it is on the top side and well talk about this in a minute. But anyways, you know beautiful 2005 Toyota 4Runner. This is our steering column U-joint. So this is the universal joint right here. This is the actual part that we replaced. You can see from the picture it’s extremely rusty and corroded and this is the U-joint. So it’s basically a cross piece with bearings and it’ll flex in two different directions but this one basically you could only move it in one direction. So that’s what was causing our issue. Mark: Alright, so rust isn’t something we’ve talked a lot other than in brakes and cars don’t seemingly rust like they used to, how often do you see vehicles like this? Mark: Haven bought one of those kind vehicles in my past of vehicle history, I am familiar with this. Bernie: Me too, you know, I’ve bought vehicles like that to and it’s like it just reinforced my conviction, have it inspected, really take a second look at it, don’t get too attached to anything just because the price is right or you like the vehicle. You know, you’ve got to look for the right one, otherwise you’re going to end up paying a lot of money to get it set straight later. Mark: So any final thoughts on this repair and Toyota 4Runners? Bernie: Well just final thoughts, pre purchase inspection. Whenever you buy a used vehicle, don’t just assume the deal’s great. Really have it looked at and 4Runners, I mean they’re great vehicles. Besides the issues with this thing, it’s still an incredibly reliable vehicle, really nice driving, definitely, probably the best SUV of its type on the road. Mark: So there you go. If you’re looking for service and you’re in Vancouver, the guys to call are Pawlik Automotive. You can reach them at 604-327-7112 to book your appointment. Or check out our blog at pawlikautomotive.com, hundreds of videos on there and articles as well as our YouTube channel and as you’re probably enjoying this on iTunes. Welcome to iTunes for the Podcast of Pawlik Automotive. Thanks Bernie. How Are Toyota Cars For Reliability? Mark: Hi, it's Mark from Top Local. We're here with Bernie Pawlik, Pawlik Automotive, in Vancouver. Bernie how long have you been repairing cars for now? Mark: 38 years of working on pretty much all makes and models and even years of cars, is that right? Bernie: I have been, yup. Mark: And Pawlik has now been voted best auto repair in Vancouver 18 times. Is that right? Bernie: That's correct. That is correct. Mark: That's pretty impressive. So, we're gonna talk about a 2005 Toyota Forerunner, and you had a heater box repair to do on this vehicle. What was going on with this Forerunner? Bernie: Well, the owner of this vehicle bought the vehicle recently, and one of the issues with the vehicle was that there was no heat on the driver's side of the vehicle. There was heat on the passenger side, but not on the driver's side. The heating and air conditioning worked fine, but only cold air, basically, on the driver's side of the vehicle. Mark: So what sort of diagnosis did you have to do to find the problem? Bernie: Well, the first area that we looked on the vehicle was, of course, being that there's heat on one side and not on the other, a lot of vehicles have the dual zone heating system, this one didn't. A lot of them had a dual zone heating system, so question is, is there a problem with one of them? There's probably a flap that moves up and down inside the heater box to control what comes from the heater core, what comes from the air conditioning evaporator core. That gives you temperature control. Obviously, this is the area we poked our head under the dash, looked to see, are there motors? Are there actuators, and of course, if you've even looked under the dash of a modern vehicle, there's an awful lot tucked in there and not a lot to see. Those are the visual inspection for the ducts, but for what we can determine the heater box had to be removed to determine the cause. The problem was inside the heater box, nothing external that we could see. Mark: So with all that stuff in the dash, that sounds like a pretty involved job. Bernie: It's a crazy job. It's a day and a bit worth of work to take everything apart. Why don't I just share some photos, because that's probably the easiest thing to do. Here’s our Forerunner here. Nice vehicle, nice sporty tires, good off road, this is a V8 too, so it's got lots of power. Nice driving vehicle. Get into some of our other photos here. Here's the dash actually partially removed. This, with the dash pad off, and you can see the console's off, the dash pad's off. Some of the heating ducts are located up here. There's big crash pad along here. We still have the steering column on at this point. Moving on to ... I'm just going to select a few different pictures here. This is the dash completely removed, with the heating box out. So you can see there's a lot of wires ... We have a few of our tools on here too, but there's a lot of wiring connectors off. Steering column's out. There's a lot involved in removing this. What else can I share here, photo-wise? We've got, share a few of these without getting into the actual repair. Well, actually we can talk about the repair, so what we found. We took the heater box off. This is the heater box here, located on the bench. The heater core, these are the pipes to the heater core here, and the heater core is located, actually, down in this area here. The air conditioning area section is over here. I've got another view of that. You can see, this is a flap, this is an air door that controls air to the, I think this will be to the heating vents or possibly for the defroster. I'm not sure which of the two. The actual issue or concern was actually inside this heating box, further down. I'll go into the next photo, which is another view of the heating box. There's the air conditioner evaporator core. This is what causes cool air in the system. Down here is where the fan is, so it blows the air ... these pipes here are for the air conditioning system, and these are the heating pipes. You can see there's a lot of parts and pieces that go into this service. Okay. There's our heater box, another view of the heater box. I'm getting right down to it. This is a look into the heater box. I should've taken a picture with it apart, but basically there is a flap here and a flap there. This is for the passenger heat, and this is for the driver. So, what we found is an actuator motor on this side of the heater box, not one here. This vehicle could be equipped with dual zone climate control, but it's not. There's a connecting rod that connects these two, broken between these to pieces. What happened is, you could get temperature control on the passenger side, but it wouldn't translate to the driver's side. This flap has stayed shut down, blowing cold air all the time. So, to repair this involved one of two things. You could buy a brand new heater box from Toyota, which is over $2,000 and not even available, or acquire a used one, which we couldn't find anywhere. Of course, at the risk this part might break again, or repair it. We actually opted to repair it. We did some custom work where we actually cut a part of the heater box apart. But this isn't really have to be dual, so we were actually able to cut some pieces apart and then join the two flaps together, so that when the passenger side moved, the driver's did too. We did it in such a way that it's never gonna fall apart, so a good, thorough repair. We don't have any more photos we need to share here. Here's a couple more with some to the dash panels and the pieces are, the framework out and I think that's only enough photos to chew off for today. Mark: A huge job and I imagine that wasn’t inexpensive. Bernie: Yeah, it was, but I'll say that we repaired it and saved the customer an awful lot of money by doing that repair. As I said, the actual heater box was over $2,000 in Canada, from Toyota, and the part wasn't available in North America anyway, so it would've taken a few weeks to get it from Japan. So for a fraction of that price, we were able to take the heater box apart. Spend a little more labor, but actually repair it properly and that's all our concern. Mark: So is this a common concern? Bernie: No, but we come across new and interesting things all the time on cars. This is one of them. This is the first time we fixed something like this on a Toyota, though. From some of our research, we're not the first people who have run into this particular problem. It has happened on other Toyota trucks and Forerunners. But as far as cars in general, we do run into problems with heater boxes. A lot of times there are actuator heater motors and, you know, modern, I'd say in the last 15, 20 years of cars, that they use actuator motors in these door flaps. So the actuator motors will die, or sometimes the actual flaps will break, so we fixed them on a variety of different vehicles, but this is the first issue like this on a Forerunner we’ve seen. Mark: So there you go. If you are looking for auto repair of your Toyota vehicles in Vancouver, the guys to see are Pawlik Motors. Bernie, do you want to sign offI’m really echoie today. Bernie: Sure. Yeah. Thank you for watching us and give us a call. As Mark often says, we're busy, book ahead and give us a call. Thank you. Mark: Hi, it's Mark from Top Local. We're here with Bernie Pawlik, Pawlik Automotive in Vancouver, 18-time winners of Best Auto Repair in Vancouver as voted by their customers. And Vancouver's best auto service experience. How you doing Bernie? Mark: So we're going to talk about a Toyota Matrix. A Toyota, oh my God, Bernie, something went wrong with a Toyota? How can this be? Mark: What is going on with this Toyota? Bernie: Um, well, this vehicle was ... the client brought his vehicle to our shop because he ... if he would drive it for a while, say, I think it was 60 kilometres an hour for 20 minutes, there was some noises that would develop at the rear of the vehicle, like either a wheel bearing or a brake or some kind of noise. So took it out for a very good, long road test, and brought it back to the shop and did some inspecting. What we found is the left rear brake calliper was sticking. Sometimes we have to take cars for very rather long road tests when people give us a description, it happens like this, the brakes are always shaking. You're driving, and there’s nothing really wrong with it, sometimes it takes a while to actually get things to occur. Anyway, in this case it was definitely the left rear brake calliper was sticking. Mark: What was causing the brakes to stick? Bernie: Basically moisture would just get into the brake calliper and sometimes it'll cause a piston to start sticking and seizing. It happens from time to time. Any brake calliper, they don't need to be replaced all the time, though I know there are some shops that seem to just do them every brake job, but really, in my opinion, that's overkill. But every ... depends on the car, but callipers after a while will stick and seize and need to be replaced. That was the issue with that. Now the other issue that we had was the brake backing plates were ... especially the left side, where it seized calliper, the backing plate was actually rusted off and disintegrated. So that's another issue that we had to deal with. Mark: What's the purpose of the backing plate? Bernie: Basically the backing plate just keeps dust and moisture from getting onto the back of the ... either if it's a drum brake, of course it's integral, you have to have a backing plate because it holds the shoes in place, but on a disc brake, the backing plate actually just keeps dust and dirt from getting on the brakes and you know, if you get too much water on the brakes, it'll cause the brakes to fade, or too much dust and dirt, it'll cause wear. So that's basically the purpose of the backing plate. I mean, if you removed it, not exactly the end of the earth. Some vehicles actually don't even have them. It depends. But most do. Mark: And how often do you change backing plates? Bernie: Not very often. We live in Vancouver; it's a pretty ... besides that it rains a lot, it's a pretty gentle climate on vehicles. We don't use a lot of road salts because we don't get a lot of snow here, but if you live in a snowier climate, where they use a lot of road salt, that's where things start to rust and rot. Backing plates are just basically just a very thin piece of metal. And they're out on the road, being exposed to salt and all that kind of thing, so they do tend to rust out. Interestingly enough, this actually is a vehicle that was in Ontario for a while where they use a lot of road salts, so that's why the backing plate had rotted out. Mark: You have some photos? Bernie: I do. Yeah, let's have a look at some. There's our '06 Toyota Matrix. Again, you know, it's 11 years old but in really good shape, and about ... I think it's around 200,000 kilometres, so the car still runs great. Just like you'd expect from a Toyota. On to the backing plates. So on the right is a brand new, from Toyota, backing plate, which wasn't actually a lot of money, it was a very well price the part. There is, it's left of the old one. The actual ... this vehicle has a parking brake as a shoe brake for the parking brake. It has disc brakes that do the regular braking, so they're separated. A lot of vehicles use a ... the rear brake calliper actually acts as a parking brake as well, so it makes the calliper more complicated, but you don't have the brake shoes. Anyway, so this backing plate comes complete with the ... this part here is still intact, where the parking brake should sit, because it's a very thick piece of metal. It takes a lot for this one to rust out, but the tin, that piece that sort of keeps the dust and dirt off the rotor was pretty much gone with the exception of this little piece here. And on the right-hand side, it was starting to break apart as well, so that's why we replaced it all. Mark: So I know you speak very highly of Toyotas. You convinced me to buy one. Is there anything else about Toyotas long-term that someone would really need to pay attention to? Bernie: Not really. You know, I think the key with Toyotas, a lot of times bad maintenance kills them. They're not perfect cars and they seem to keep getting better and better every year, like it seems like with almost all brands of cars, more reliable. But it just, again, the key is just proper maintenance. Regular oil changes, regular service, regular inspections. It'll keep the car going well. There's really nothing I can say about a Matrix that would ... other than good things. It's a good, reliable car. Mark: So there you go. If you're looking for service for your Toyota Matrix or Toyota vehicle in Vancouver, the guys to see are Pawlik Automotive. You can reach them at 604-327-7112 to book your appointment. Book ahead; they're busy. Or check out their website, pawlikautomotive.com. We have tons of information on there. Or our YouTube channel, Pawlik Auto Repair. You can see hundreds of videos on there from many years of cars and repairs. Thanks, Bernie.